Some 50 cows in Britain have been fitted with 5G-enabled wearables for easy herd management. One of the wearables is the controller for a robotic milking machine. Yes, you read that headline right. While we’re all just sitting here and conjecturing about the name of the next 5G-enabled OnePlus smartphone, cows in Britain are already using 5G technology. Allow us to elaborate. According to a recent article by Reuters, Cisco Systems, Inc. has set up 5G network testbeds in three rural areas of Britain for wireless and mobile connectivity trials. 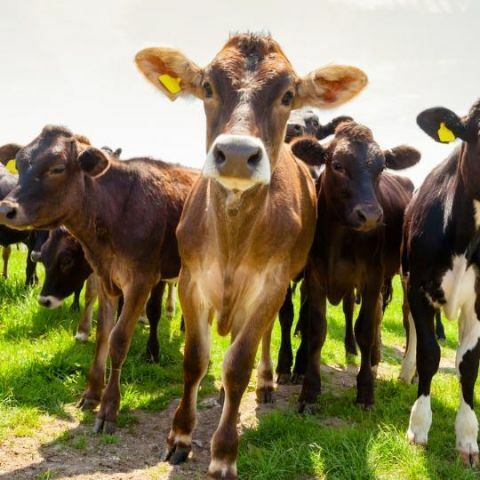 This means that some of the cows in southwest England are wearing 5G-enabled devices on them, one of which is the controller for a robotic milking system. According to the Reuters report, this is how the new 5G-enabled test solution from Cisco works in rural Britain: a cow feeling ready to be milked approaches the milking machine’s gates, which open automatically. The machine then recognises the cow’s teats and draws milk from them, while robotically giving the cow something to eat as a reward. Approximately 50 out of 180 cows in the government-funded Agricultural Engineering Precision Innovation Centre (Agri-EPI Centre) in Shepton Mallet, England are currently wearing smart 5G-enabled collars and health-monitoring ear tags. “We are testing the ability of 5G to transmit the data from our sensors much quicker, and not via the farm’s PC and a slow broadband internet connection. And the significance of that is it means that this sort of technology could be taken up ... not just on farms but on rural communities right across the country,” said Duncan Forbes, Project Manager at the Agri-EPI Centre in Shepton Mallet to Reuters. The ear tags help the handlers in the farm come to know of any distress the cows may face. In addition to the 5G-enabled bovine wearables, the dairy, which was set up by the Agri-EPI centre and Britain’s innovation agency, uses a range of new technology, including automated brushes that rotate when a cow rubs against them, sensor-driven curtains that open based on the weather, and a smart feeding mechanism that automatically delivers food to cows inside a barn using ceiling-mounted rails. While these cows in Britain are busy helping out with 5G network trials, we humans can continue to speculate on the commercial rollout of 5G technology.